The iPhone maker and Wisconsin taxpayers made a $10 bln bet on a manufacturing revival in the United States. Now Terry Gou’s outfit says making flat screens there is uncompetitive, and jobs will be in research and design. It’s a reality check for Donald Trump’s industrial dream. 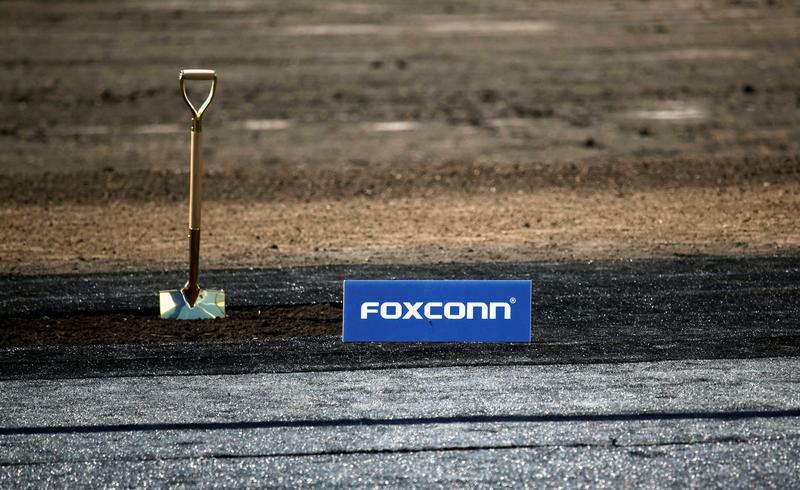 A shovel and FoxConn logo are seen before the arrival of U.S. President Donald Trump as he participates in the Foxconn Technology Group groundbreaking ceremony for its LCD manufacturing campus, in Mount Pleasant, Wisconsin, U.S., June 28, 2018. Foxconn Technology Group is reconsidering plans to produce advanced liquid-crystal display panels at its Wisconsin facility, Reuters reported on Jan. 30. A company official also said about three quarters of jobs it eventually creates will be in R&D and design, rather than manufacturing. The Taiwanese manufacturer has said it intended to create 13,000 jobs in the U.S. state, but also said it slowed the pace of hiring. It initially expected to employ about 5,200 people by the end of 2020; that figure now looks likely to be closer to 1,000 workers, Reuters reported, citing a company source. The facility, which is eligible for around $4 billion of tax breaks and other incentives under certain conditions, was announced in 2017 and marked the largest ever U.S. greenfield investment by a foreign-based company. The Wisconsin governor’s office said on Jan. 30 that it had been in contact with Foxconn’s leadership. An aide said the office was “surprised” by the story.